During the course of his life, Leonardo Da Vinci mastered innovation. He is credited with designing the greatest inventions of our time: the modern helicopter, scuba gear, and parachutes among others. Today, Leonardo is the inspiration behind SAP’s Digital Innovation System – a suite of offerings that includes technologies such as machine learning, blockchain, the Internet of Things (IoT), conversational applications, and more. SAP hosted its second Leonardo Live event on November 2, 2017, in Chicago bringing together an array of customers and partners. 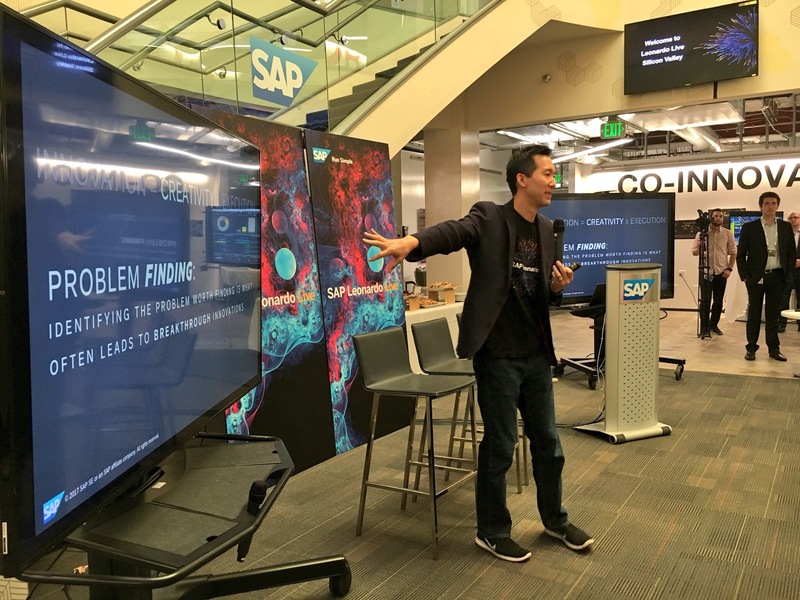 A satellite event was held at the same time at SAP’s Palo Alto campus where customers and partners converged to watch demos and learn more about SAP Leonardo, and digital transformation was on everyone’s agenda. John McGee, Managing Director of SAP’s West Region, discussed how the concept of Digital Transformation entails utilizing innovative technologies to transform business processes to improve efficiency and productivity. These advancements are enabled by the plethora of data sets that have been collected over the past decades via new technologies like IoT and machine learning. John believes that digital transformation can improve businesses by allowing them to better engage with customers and even improve supply chains. Another focus area of the event was design and its significance in the context of innovation. Sam Yen, SAP’s Chief Design Officer and Head of Design Thinking (pictured below), defined innovation as the result of a successful relationship between creativity and design. Sam discussed how for there to be true innovation in an organization, there must be an environment that fosters and nurtures a creative spirit. The Leonardo Live event presented SAP the opportunity to converge with its customers and partners to discuss the exciting road ahead. 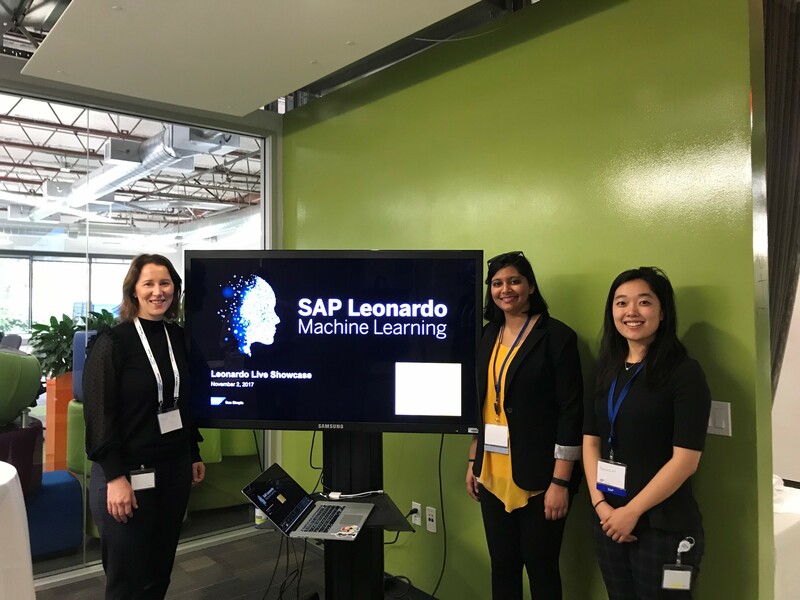 The Machine Learning team from the SAP Innovation Center Network (ICN) showcased its innovative offerings, that will ultimately become an integrated part of business solutions, and help to automate the time-consuming, laborious processes that plague many traditional business models. SAP Leonardo Machine Learning uses image detection and similarity scoring services to find the best possible match by analyzing the characteristics of the images. The use of unmanned aerial vehicles (UAV) – better known as drones – have become more prevalent in a number of sectors. For example, camera-mounted drones are currently used to analyze volcanoes, monitor storms, study climate change, survey hurricane damage and even find shipwrecks. The Dragon Fly team from the ICN is now also looking into a whole new way to utilize drones. In the rapidly changing supply chain domain, it is essential for businesses to have real-time visibility over their inventory in order to make data-driven decisions. Shelf inventory and warehouse management is a $3 billion market and businesses rely on inventory visibility to make decisions. It is, however, a time consuming and labor-intensive process that results in massive delays. Let’s face it, nothing drives a customer into the open arms of a competitor more quickly than an empty shelf or a sold-out product. The proposal: Equip self-flying drones with machine learning-based computer vision technology. “Incorporating the vision intelligence into drones will bring the intelligence of location, vision and enterprise knowledge into one solution”, according to Xiwei Zhou, Director of Engineering, SAP Innovation Center Silicon Valley. The drone flies in-doors, on an autonomous path to scan the shelf, take pictures and instantly stream it to the backend powered by SAP Leonardo Machine Learning foundation to recognize the item, record the placement location, sync with the inventory. Employees in retail stores will be free from spending their time physically scanning products and replenishing empty shelves. With the press of a button, the drone will scan the store and inform you of which spots need checking. Additionally, this allows clerks to focus on face-to-face interaction with their customers and offer the best possible service. Similarly, in a warehouse, the drone will keep a record of all the items. No longer will employees have to manually search through every nook and cranny or climb ladders, with a simple search, the drone will lead them right to the product. Suffice it to say, computer vision enabled drones as a tool to collaborate and analyze data for real and valuable insight could have a widespread impact on the industry. Blockchain is leading the charge among a host of emerging technologies. With the potential to change the way businesses operate, blockchain promises to increase transparency and security, streamline business processes by reducing the importance of intermediaries, and to solve information imbalance. Under the SAP Leonardo umbrella, blockchain could be the solution to improving processes within the Drugs Supply Chain, Disaster Operations, Secure Bidding and Procurement, and Distributed Manufacturing (3D Printing) as well as Trusted Digital Credentials and Real-Time Payments. Andreas Fichter represented the blockchain team at Leonardo Live in Palo Alto and talked about the opportunities within the space, and its potential use cases. “The SAP Cloud Platform Blockchain service is at the forefront of digital transformation. With this service, we will enable customers to leverage the benefits of distributed ledger technology and provide integration with SAP core products such as S/4 HANA,” he explained.